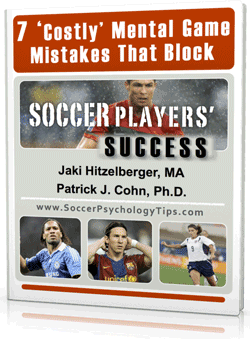 Fear of losing, being judged, criticized, making mistakes, getting injured or losing paralyze soccer players. What do you do to overcome these fears? In fact, a little tension is normal and, at times, productive to motivate a play to act or push them to perform at a higher level. So how in the world can you deal with fear, if at all? When you’re tight or afraid to make mistakes, for example, you can’t let it happen and get into the flow of the game. You judge your game and think too much about outcomes. Your primary goal is to trust your athletic ability when you play. A present-moment focus is a matter of seeing the field and reacting. Reacting in the game is the best way to not over think. What’s the opposite of reacting? Over thinking, over analyzing, and over controlling your skills. Sam Allardyce, soccer manager of Crystal Palace has seen his team drop to 19th in the Premier League with a stretch of nine losses in 12 home games. To help his team manage fear [or stage fright as he has called it] and play more freely, Allardyce brought in a sports psychologist to work with his team. Allardyce is a firm believer and advocate for the use of psychology in soccer. In fact, Allardyce has worked with sport psychologists himself to help him become a better coach. “Just relax, don’t stress” is not the answer for fear or anxiety. How do you relax? Step one is to know what makes you anxious during a game. 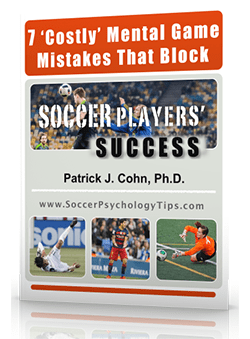 Are you afraid of making mistakes and disappointing teammates, for example? Step two is to stop projecting what will happen if you make mistake–this is the source of your anxiety. Keep your thinking and the game simple. Focus on what you have to do one touch at a time! Focus on performing freely and trusting your skills from practice. 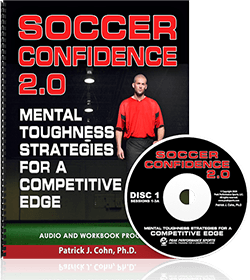 Learn all my mental game strategies for mental toughness in soccer with Soccer Confidence CD and workbook program.